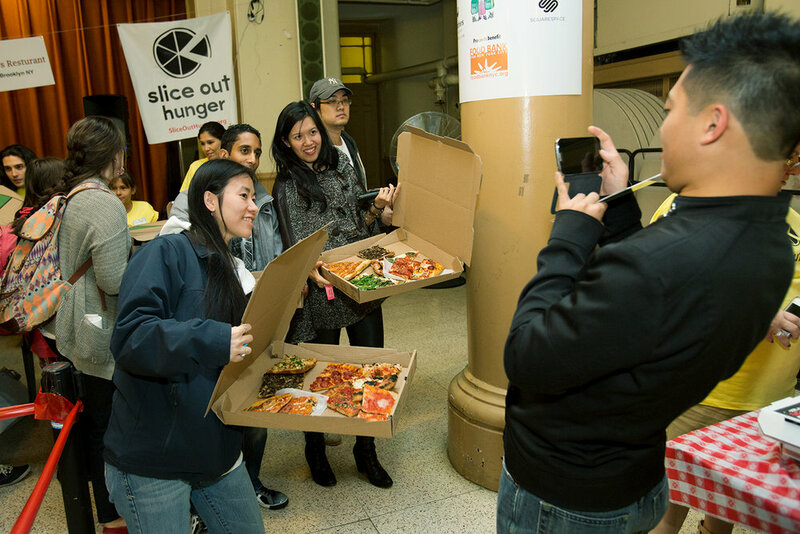 Slice Out Hunger, Scott Wiener’s pizza-charity extravaganza, rocked the Village again last week when more than six hundred people waited in a line that went nearly three-quarters the way around a city block for $1 pizza slices from 43 of New York's best-known shops. 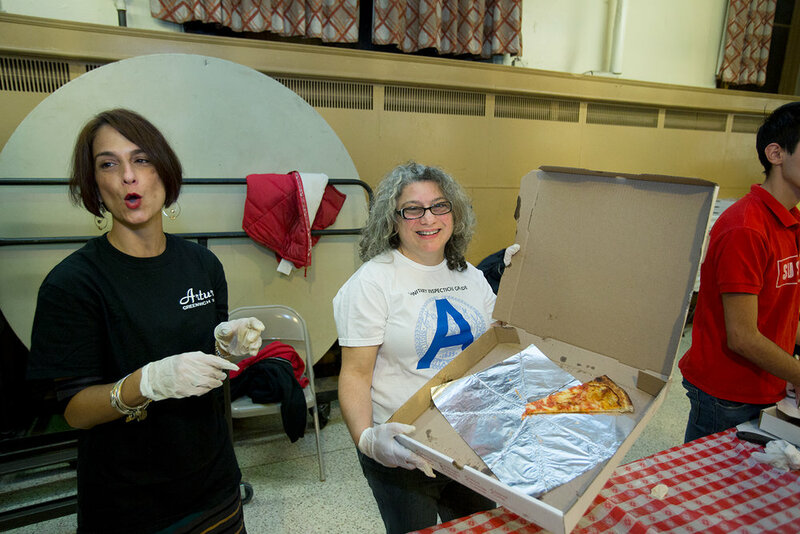 In total, those pizzerias donated 800 pies and over $20,000 was raised for Food Bank For NYC, a non-profit that provides 400,000 free meals a day for New Yorkers in need. The money from Slice Out Hunger's equates to 100,000 meals. 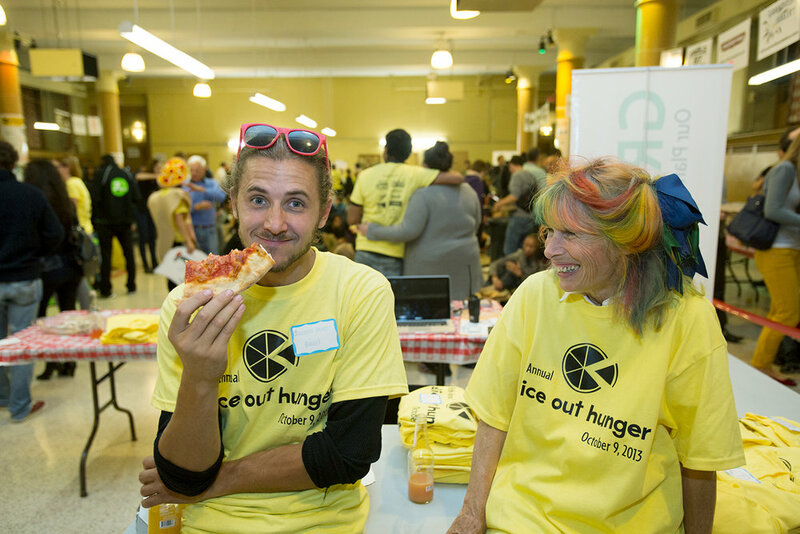 SLIDESHOW: Slice Out Hunger 2013 - Pizza Eaters, Pizza Makers. Checking out the offerings from Forcella Pizza (1 loc in Brooklyn, 2 in Manhattan). When it comes time to making choices, even at $1 it's serious business. I haven't been to Table 87, but it's right near me and that pizza looks good. Officially on the To Eat List! That's Scott (at left), the organizer of the event. I remember this guy from last year. You can tell he knows what he's doing. Lucali's pizza at right, Di Fara's at left. Are they similar? Mark Iacono of Lucali serving his pizza. I hope he didn't say, "Say cheese." That's PJ from Pizza by Certe. Amazing little place in Midtown. Scott gets lots of volunteers to help out. One of Arturo's owners. Such an underrated place. Coal oven pizza, free live jazz - huh? One place - Neapolitan Express - brought its own oven. Not fair! Last year I documented the event by making a video (which is posted to Pizzacentric here). It documents the excitement that ensues at the event, which Wiener calls "New York City's Biggest Pizza Party": loud DJ'd music, enthusiasm for pizza by everyone there, Wiener himself (who last year made some announcements over the loudspeaker system but this year didn’t), and of course - boatloads of pizza. This time around I decided to take still photos. You can see a slideshow of my faves by rolling over the above photo. Who in the world knows how big the event will become for next year. But damn straight I’ll be there. I’m sure the line will be long. And that time, I just may pack up one of those boxes they provide with enough slices to bring home and reheat in the toaster oven for lunch the next couple days afterwards. That’s what I saw a bunch of Village locals doing. Pretty smart - especially considering that by the time most attendees get to the actual pizza, it has cooled to room temperature. Slice Out Hunger takes place every October at St. Anthony's Church, at the corner of Sullivan and Houston Streets. Here's the Slice Out Hunger Website.